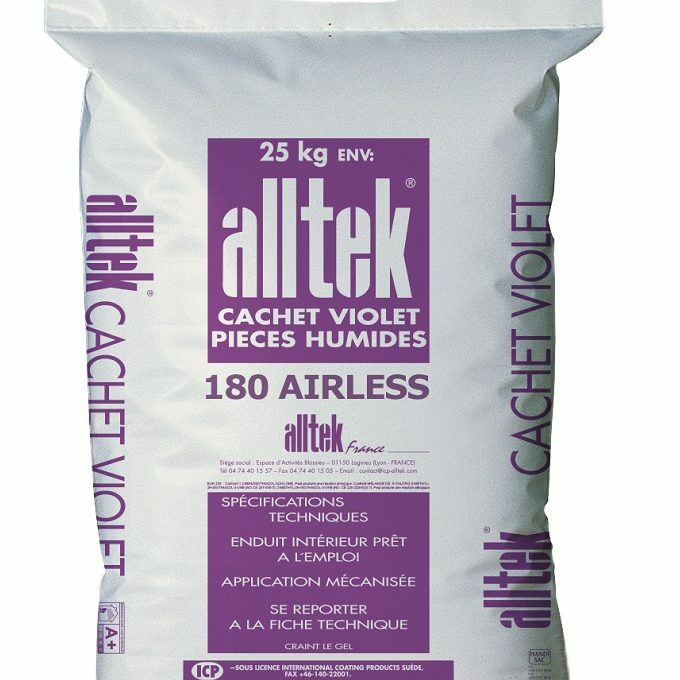 Lightweight 2 in 1 plaster for airless application: good filling properties, can be used for jointing plasterboards. 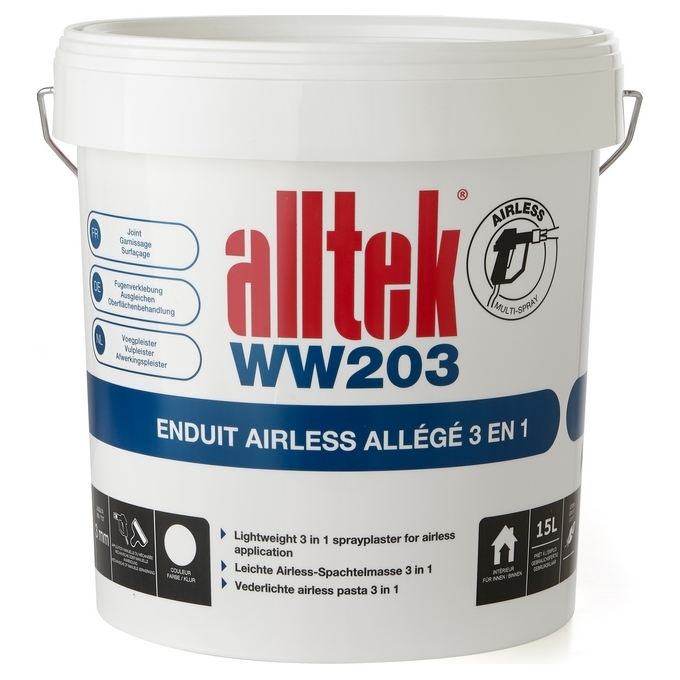 Alltek WW203 is a ready-to-use light grey plaster which clearly shows up the areas still to be sanded. Its incomparable smoothness makes skimming and sanding extremely easy and fast for a high quality finish. Plaster for interiors, walls and ceilings on all standard substrates. Can be used for filling joints between plasterboards with feathered edges. With its low density and its incomparable spreadability, it minimizes spreading effort thus strain on the workman. Its lightness means it can be sprayed airlessly with a very long flexible tube. Perfect for rough concrete due to its filling capacity. Can be used as a finish on scratch plaster. 1 litre/m² per mm of thickness. 12 to 24 h on average, depending on application thickness, temperature, ventilation, humidity and substrate type. Sanding and recoating: after complete drying. Ergonomic and rapid application, minimum retouching. Excellent adhesive properties (IREF test report no. 05/2-105-L20). Fire rating: A2-s1, d0 as per European standard EN 13501-1. Classification: group III class 2 as per the standard AFNOR NF T 36-005, compliant with the standard AFNOR NF T 30-608 and the standard EN NF 13963: 2014. Shelf life is 1 year in unopened original packaging, protected from frost and extreme heat. VOC content: < 2 g/l. Terracotta bricks and tiles, plaster, gypsum blocks, plasterboard. Wood and wood products, old painted substrates in good condition. The substrates, preparatory work and application conditions must be compliant with applicable building trade regulations (e.g. DTU) and standards. Stir before use if necessary. All airless pumps, flow rate > 5 L (do not use filter). Airless 27 to 45 nozzles, depending on condition of substrate and equipment used (follow the manufacturer’s advice). Flexible smoothing knife of “Parfaitliss” type or similar (up to 1 metre wide on ceilings). Sanding with grain size 150 to 220. Ensure adequate ventilation to remove excess moisture and accelerate drying. 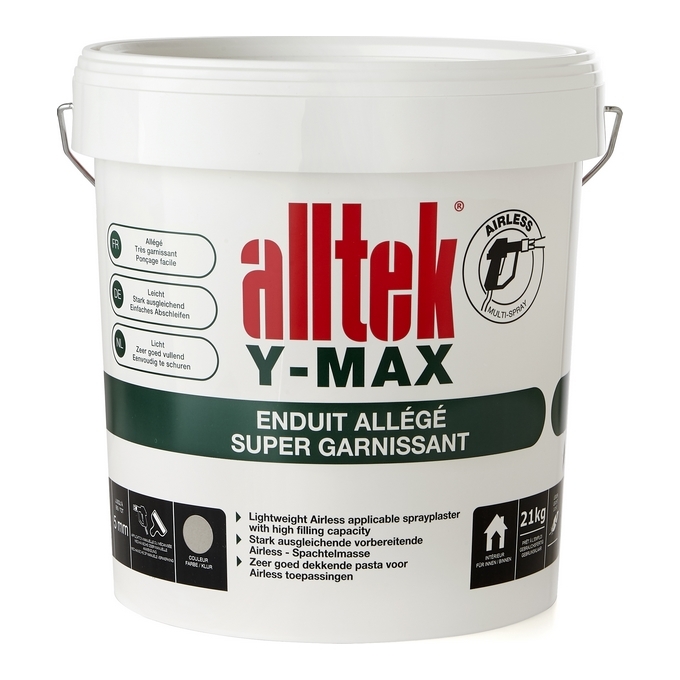 Alltek ready-to-use surface fillers are made from a finely-tuned mix of filling materials with a special combination of bonding agents so they adhere well and are easy to work. They meet all the relevant international standards. 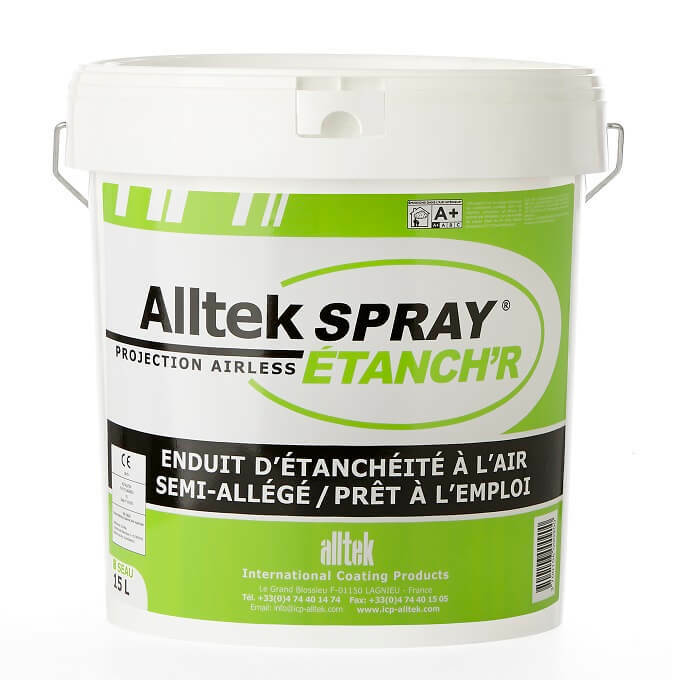 For your convenience, increased productivity and value for money, ICP Alltek offers a full range of fillers for application using conventional or airless sprayers.